I’ve changed the way I look at diets, weirdly enough. I used to be one of those people who prefers not to eat when dieting, because everything would make me feel guilty. I used to think it’s good enough to survive on rice. And then of course, a week or so later, I would throw myself at the chocolate isle and wake up in a pile of wrappers and empty pizza boxes. Ha. Not anymore though. I suddenly realised I actually love a lot of healthy foods – for example, I never realised that sushi isn’t a crime against humanity when you’re trying to lose weight. Not to mention lately I’ve been a total vegetable-maniac. So my diet is still going, and weirdly (apparently) you can already see some results. I buy things like matzos, hummus, all kinds of fish, celery, eggs, tomatoes, peppers, mozzarella, wholemeal wraps and loads and loads and loads of green tea. Every time I get hungry between meals, I buy a small bag of mixed nuts, or a smoothie, or have a cup of green tea, and it totally works. The gorgeous salmon steak with crispy skin really doesn’t need a lot of attention. The best thing is to salt generously the skin and place it into a hot pan with a little oil, skin down. In 2 minutes, the skin will be crispy. I also love to leave the middle completely raw (and I mean really) – is that just me? I just turn it pink on the outside, and the inside is still juicy and raw. I love it. The soba does make 50% of the pleasure though. 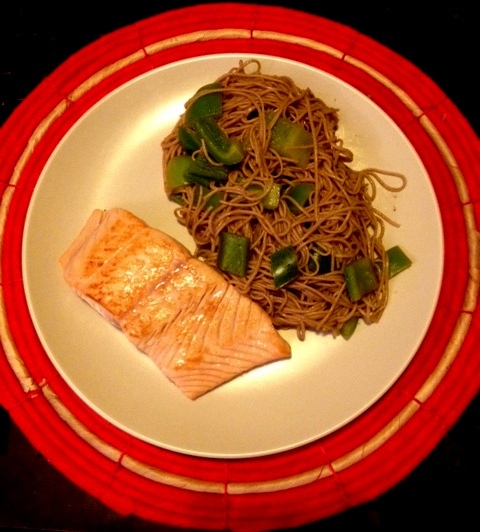 Soba is a kind of noodle that is usually made from buckwheat wholly, sometimes mixed with flour – as long as you buy the buckwheat version, you can consume this guilt-free. Low in calories, it is absolutely delicious. Mind you, a bit flavourless, so a bit of help is always good. In this case, I boiled the noodles until ready, and then I mixed it with some chopped green peppers, a dash of soy sauce and a teaspoon of tamarind paste. Heating it through just a little, the noodles take on the delicious taste and are a delight to eat. So… low in calories and fat, but absolutely delicious… What are you waiting for, eh? 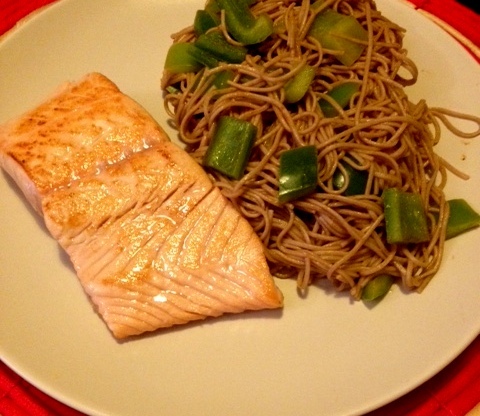 This entry was posted in Blog, Main meals and tagged Asian, cheap, cooking, diet, dinner, easy, fish, food, healthy, ingredient, meal, noodle, pepper, quick, recipe, salmon, soba. Bookmark the permalink.